NoteStream app in use at the Blackstar concert. Photo: Justin Knight. ConcertQ (formerly NoteStream) app in use at the Blackstar concert. Photo: Justin Knight. David Bowie’s Blackstar performed by Maya Beiser with the Ambient Orchestra. Photo: Justin Knight. David Bowie's Blackstar performed by Maya Beiser with the Ambient Orchestra. Photo: Justin Knight. Evan Ziporyn conducts his arrangement of David Bowie’s Blackstar, performed by Maya Beiser with the Ambient Orchestra. Photo: Justin Knight. Evan Ziporyn conducts his arrangement of David Bowie's Blackstar, performed by Maya Beiser with the Ambient Orchestra. Photo: Justin Knight. Evan Ziporyn conducts his orchestral arrangement of David Bowie’s Blackstar performed by Maya Beiser with the Ambient Orchestra. Photo: Justin Knight. Evan Ziporyn conducts his orchestral arrangement of David Bowie's Blackstar performed by Maya Beiser with the Ambient Orchestra. Photo: Justin Knight. Maya Beiser and the Ambient Orchestra receive audience applause. Photo: Justin Knight. Celebrated as a revolutionary in music and visual culture, Bowie should also be remembered as a web pioneer. He embraced technology at every turn—from BowieWorld’s 3D chat environment to 360-degree interactive webcasts to crowdsourcing a “cyber-song” (years before crowdsourcing was even a thing). So it was fitting that Evan Ziporyn’s orchestral version of Bowie’s Blackstar, a collaboration with acclaimed cellist Maya Beiser and the Ambient Orchestra, which premiered in Kresge Auditorium on March 3, 2017, had flashes of innovation beyond the performance onstage. Eran Egozy, Professor of the Practice in Music Technology at MIT and co-founder of Harmonix Music Systems, known for the Guitar Hero series of video games, created ConcertCue (formerly NoteStream), a live program note web-app that was featured in the Blackstar concert. NoteStream upends the printed program, replacing it with a digital interactive format designed to work on smartphones and to deliver content to listeners in real time. Egozy worked with Lauren Flood, Mellon Post-Doctoral Fellow in Music & Theater Arts, and Nathaniel Gutierrez, MIT senior in Course 6.2, to give the concert program this digital makeover. Flood helped author the content and design the visual elements. Egozy says, “We have already learned a lot about authoring content for this experience. There is a strong temptation to add more and more information. But the key is scaling back and giving the users space to look away from their phones and be immersed in the live performance.” Flood, in consultation with Ziporyn, sought balance; she interspersed lyric bursts and composer’s notes with moments of rest—a subtle cue for users to shift focus from their screens to the stage. Gutierrez, who won a 2017 Wiesner Student Art Award for his work on ConcertCue, focused on the engineering demands (the server must be robust to withstand 1,000 simultaneous users), the design requirements (how to present information that is useful but not distracting) and aesthetic concerns (how to achieve the right “feel” in the given context). Gutierrez was also responsible for the actual synchronization of ConcertCue during the concert. He functioned both as programmer and Score reader (to sync the content delivery system with the notes played). Eventually, the synchronization will be automated. Moreover, if the thought of the audience using cell phones during a performance gives some pause, they should consider how concert programs have evolved and adapted to changing technologies over the centuries. Based on the earlier playbill and printed opera libretto tradition, concert programs became a standard feature by the 18th century. From the late 1870s, programs incorporated images created with daring new printing techniques, like chromolithography. With the invention of photography, images of performers (or advertisements) crept into the program. There was even an attempt to create a multi-sensory program impregnated with perfume in the 1860s—thanks to the perfumery firm and program sponsor Eugene Rimmel. The performance environment changed too, as candles gave way to incandescent lights, now LEDs. If widely adopted, ConcertCue may introduce the faint glow of smartphones to the concert hall; but take heart, whatever initial disquiet may be caused by reimagining the familiar printed format, breaking the spell of complacency among concertgoers generally proves to be a good thing. What’s more, for Bowie, status quo would never do. 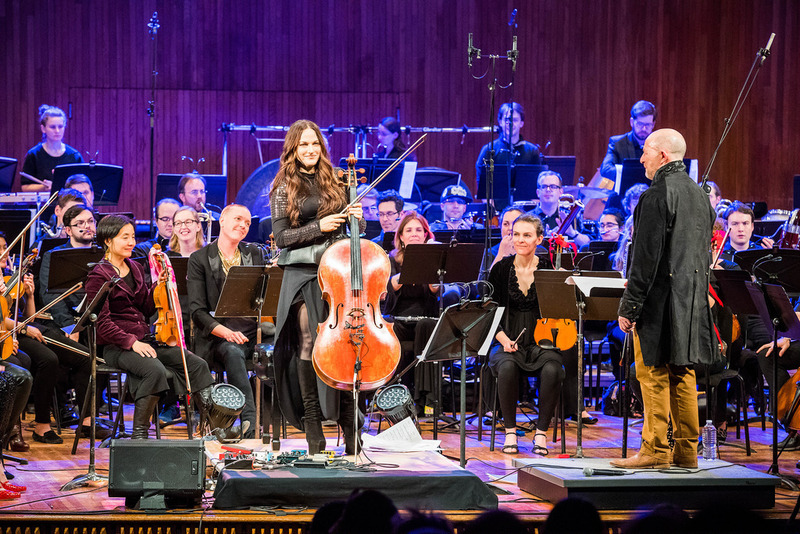 The Terry and Rick Stone Concert featured a startling new version of the complete Blackstar, David Bowie’s last album, by CAST Faculty Director Evan Ziporyn & cellist Maya Beiser. Beiser, CAST’s Mellon Distinguished Visiting Artist, performed with the 60 piece Ambient Orchestra, conducted by Ziporyn, as part of the MIT Sounding series. Eran Egozy with Nathan Gutierrez. Photo: John T Lumacki (for the Boston Globe). Jake Gunter's lighting design for 'Small Infinities.' Isaac Newton in the foreground, played by Ben Spiro '17, and Hannah Smith, Newton’s mother is in the background, played by Sabrine Iqbal '17. Photo: Jake Gunter. Maya Beiser at the 2017 CAST Symposium. Credit: L. Barry Hetherington. "Don't You Know," an original song from Jacob Collier's debut album 'In My Room'. Photo: courtesy of the artist.